30th April 2012 a 9 year old school pupil starts the NeverSeconds blog as a writing project with her dad. Martha writes about what she gets for school lunch and takes photographs. This is done with the approval of the school. The blog also acts as a link to raising money for a school meals charity. Blog gets some good attention, kids from other places send pictures of their own school meals and they are posted. June 2012, negative press articles attract the attention of those responsible for providing the meals, the Local Council. Thursday 14th June Martha is told to stop taking photographs of school dinners by the Council. Martha publishes this on the blog in a ‘Goodbye’ message. The world of social media, twitter in particular, erupts. A very prominent school meals campaigner (Jamie Oliver) sends a message of support and encourages his 2.3 million followers to retweet it. Twitter gets very busy with people talking about ‘#neverseconds’. The story is picked up by television, radio and newspapers. Politicians become involved, some via twitter. Considerable pressure is put on the Local Council. Friday 15th June the Council reverses the ban and Martha is allowed to use photographs of the school meals in NeverSeconds. This all happens within a 24 hour timeframe. ……and the world of social media erupts even further. Never Seconds blog had received in excess of 4,500,000 page view by 11am on Saturday 16th June (still climbing). The page view counter on Saturday morning was flicking over at rate too fast to count. It was about 200 views per minute (12,000 / hour) when it had slowed down a bit. The ‘#neverseconds’ hash tag attracted thousands of tweets. The donations to the school meals charity have reached over £45,000, the fastest rate of donations they have experienced; and it’s still going on. There are 2 more weeks until the end of term, plenty of time for more school dinner blog posts. The council has received a massive amount of publicity in a very short space of time. Most of it negative, using phrases like ‘bully’. It’s going to be an interesting day back at work on Monday. Will this improve the quality of school meals? Particularly once social media has gone away? Who knows, but the fear of a return to this level of exposure might be a big motivation. What happens next for Never Seconds and Martha? Censorship is a risky activity in the world of social media. It backfired hugely for this council (even if they do claim good reasons). The speed and scale of social media will cause problems for most organisations. Most public services aren’t equipped for this sort of 24/7 media pressure. As an example of ‘citizen voice’ from within a group of generally ‘quiet’ people (primary school kids), this is a pretty loud and high impact. As part the ‘digital natives’ entering wider society and the world of work, there is an interesting future ahead for public services. 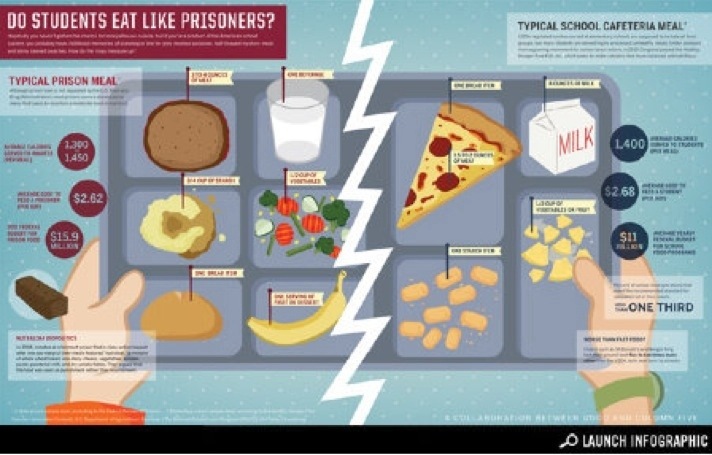 Infographic: http://awesome.good.is/transparency/web/1105/lunch/flat.html Do students eat like prisoners? Well worth looking at. Also have a look at the Streisand effect. http://en.wikipedia.org/wiki/Streisand_effect. An attempt to hide or remove a piece of information online has the unintended consequence of publicising the information more widely. ← If Carlsberg did Physics Teachers…. they would make Alessio Bernardelli.